Mixology takes flight! Order a mini bottle of rye and mix up a pair of Old Fashioneds right at your seat. Make it a smooth flight with Old Fashioneds for two when you carry on this personal cocktail kit. The kit will sail through security and supply you with everything you need to practice your mixology at 30,000 feet: pure cane sugar, small batch bitters, and a mini bar spoon / muddler. Just order a mini bottle of rye, and mix up a classic, jet set cocktail at your personal, one-seat bar. The flight-themed tin and linen coaster add a dash of first-class flair to the affair. Consumables sourced in the USA; kit developed and assembled in the USA. 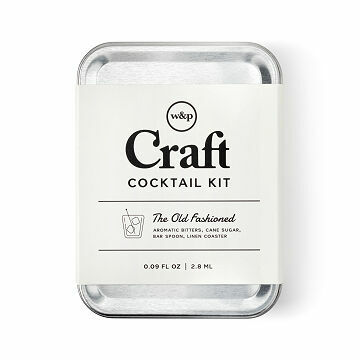 Check out our Gift Lab to see us mix an en-route Old Fashioned with the Carry-On Cocktail Kit. Makes two Old Fashioned cocktails. Alcohol not included. Our son's best friend from elementary school graduated from college and loved this gift. The quality is exceptional and the playfulness is brilliant. Perfect for the first job which includes lots of travel. The product came quickly and exactly when it was said to arrive. The product is good quality and such a great gift idea for a traveler that has everything but would like something unique. I recommend this! Great Gift for a Trip Overseas! My husband was heading over to the UK for work and I bought the Cocktail Kit as a fun gift to send him away with. He just loved it! He confirmed that it made the 8 hour flight day seem not so bad. The adorable packaging and little spoon really made it something special. I bought this for a Christmas gift so for now it just sits waiting to be wrapped for Christmas. I did open the cool tin though. The packaging is very well done. I love the uniqueness of it. I can't wait to give this gift! The product came in a timely manner, the packaging was adorable. My husband can't wait to use it on the plane!